Pogba turned on the style for France! The international break is over and the domestic season again assumes centre stage. As always, several Manchester United players were involved in action for their countries over the last week and, as the Red Devils prepare to host Watford in the Premier League on Saturday, we look back at how they fared on international duty. United’s No.1 featured in one of Spain’s two Euro 2020 qualifiers as La Roja beat Norway 2-1. There was slight frustration for De Gea, however, as he was beaten from 12 yards by Josh King. The 28-year-old sat out the win over Malta, with Chelsea’s Kepa Arrizabalaga deputising. The centre-back scored and then suffered an injury scare during Ivory Coast’s 3-0 win over Rwanda. Bailly scored his country’s second on 67 minutes but was substituted on 81 after colliding with a Rwandan player during the Africa Cup of Nations qualifier. Bailly subsequently did not feature in the Elephants’ friendly win over Liberia. The defender pulled out of the Sweden squad for their qualifiers against Romania and Norway to attend the birth of his child. It’s unknown whether or not the 24-year-old will be available for the Watford game. The 22-year-old midfielder featured in 20 minutes of Scotland’s miserable 3-0 defeat away in Kazakhstan, replacing John McGinn. McTominay got slightly more game time in the win over San Marino, playing 33 minutes after taking Callum McGregor’s place and picking up a booking in the 90th minute. The midfielder, who celebrated his 26th birthday this month, starred for France as Les Bleus got their Euro 2020 qualifying campaign off to a flyer. Pogba produced a wonderful assist for Antoine Griezmann in the 4-1 defeat of Moldova and completed 90 minutes in the comprehensive 4-0 win over Iceland, forming a strong partnership with N’Golo Kante. Pogba saw more international action than any other United player this week. Pogba was unable to link up with Martial on France duty, however, after the latter was forced to pull out of the squad after picking up a knee injury in United’s FA Cup defeat at Wolves. It only compounded Martial’s frustration with international football. The 23-year-old winger has not featured for Didier Deschamps’ since March 2018, after which he was omitted from the World Cup squad. 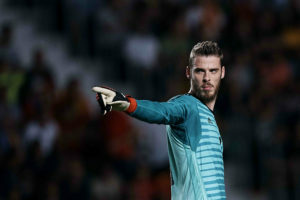 United’s top scorer was forced to sit out Belgium’s win over Russia and did not travel for his country’s second game, in Cyprus, having picked up a foot problem. The 25-year-old is a doubt for the Watford game, which is a blow given he has scored six goals in his last four appearances. Adding to United’s extensive injury woes, Rashford was forced to sit out England’s victories over Czech Republic and Montenegro. Rashford had been training alone at St George’s Park before being sent home by Gareth Southgate to treat an ankle problem he has been struggling with since United’s draw with Liverpool in February. The 21-year-old has been receiving treatment but there has not yet been an update on whether he’ll be involved on Saturday. There is a chance, given that Rashford has effectively played through the problem over the last month, that United’s medical staff will urge him to take the extra rest. Of course, while that is obviously a sensible course of action, if Rashford is unavailable, Solskjaer looks desperately short of attacking options. Alexis Sanchez is out for at least another three weeks and, with Martial, Lukaku, Juan Mata and Jesse Lingard all struggling for match fitness, the Norwegian may consider dusting off his old boots and selecting himself for the Watford game. The more likely option, of course, is that some of the club’s rising stars – Tahith Chong and Mason Greenwood chief among them – will be included in Saturday’s matchday squad. After back-to-back defeats and a spate of injuries, Solskjaer and his coaching staff know that the result matters more than a free-flowing attacking performance against the Hornets. Three points will steady the ship and move the Red Devils back into the top four for at least 48 hours, with Arsenal hosting Newcastle on Monday night.